Hullabaloo – 7.30pm, and 3rd Tuesday of every month. £5pp. Hullabaloo is a monthly night of musical adventures dedicated to free improvisation and a love of music, sound and noise. Anyone can join in, with their voice, acoustic or electronic instruments and sound makers. The evenings will mix open improvisations with sonic games and exercises aimed at developing or shaping improvisation skills. Hullabaloo is at CICCIC in Taunton on the third Tuesday of every month and starting at 7.30. There will be a small charge to cover room hire of £5pp. 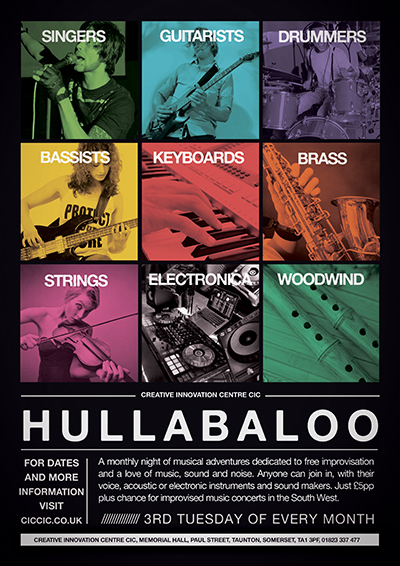 Hullabaloo is part of an idea to create an improvisers network in the South West, linking with similar happenings in Dorset, Devon and Bristol, promoting improvisation and forming a group or ‘orchestra’ out of this network. Improvising groups, orchestras and collectives exist all over Britain and other parts of the world. Improvisation, and especially free improvisation, is an important part of music making and has extra-ordinary benefits for the general musicality of all musicians. There is a rich tradition of free improvisation drawing on jazz, classical music, rock and beyond to create some of the most remarkable music making of the last 100 years. It is a way of music making that is about listening and creativity and can be explored and enjoyed by everyone. A similar evening is being planned for the Eastville Project Space in Yeovil. Future ideas include a promoting improvised music concerts, a Festival of Improvisations, vocal improvisation workshop and group, and school and college sessions. For more information contact Tim Hill on milton3hill@yahoo.co.uk or 01823 490219. Pay on the door and bring your instruments and/or voice.